I'm not the kind of person who goes out. I'm a stay in kind of gal, and one of my FAVORITE things is to have a big slumber party!! I do NOT have them enough (and I'm really pushing for that to be my bachelorette party main premise :P). They're always the best: you just need your girls, some great movies (preferably of the chick flick variety or--if you were me and my bestie in high school--old movies from the 40's and 50's), and good FOOD! You may recall a previous blog post where I talked about one of my favorite quick meal/appetizer/snack/I'm hungry/ solutions: Mrs. T's Pierogies! They are the PERFECT addition to any get-together (whether you're the kind of person who is going to watch the game, or have a fancy dinner party, or enjoy a big slumber party, or just a Tuesday!) I always have at least 1 box in my freezer, guys. For emergencies. So, my girls came over, we pajama'd up, I brought out 3 of my fave slumber party movies (27 Dresses, 13 Going on 30, and 10 Things I Hate About You), and brought out the food! 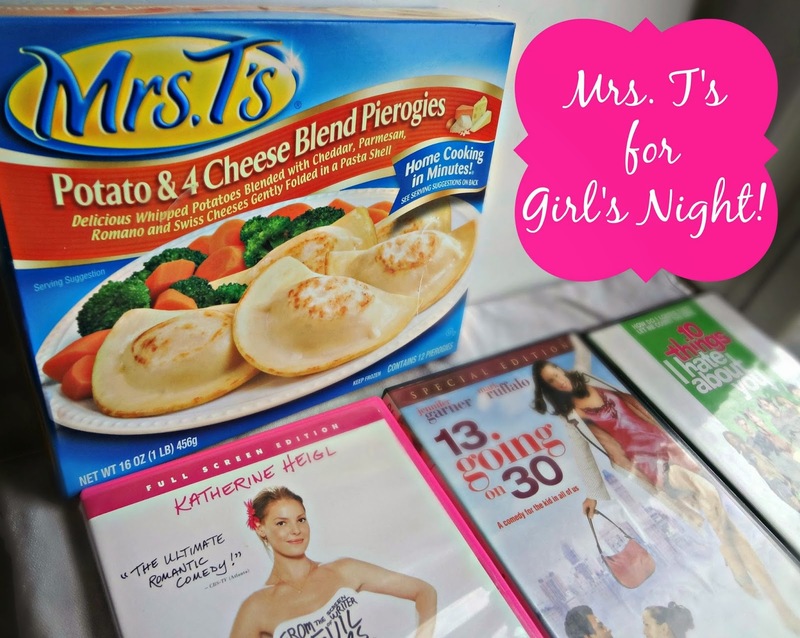 We had a big assortment of Mrs. T's Pierogies, some popcorn, some cookies, some drinks (water for me, and whatever adult beverages my ladies brought for themselves :P) and settled in to laugh, girl talk, and half watch/half mock/half ignore our movies. All while chomping on food and pigging out. It was a GOOD. NIGHT! If you want to have your own amazing night, I definitely recommend some Mrs. T's Pierogies. They could NOT be simpler to prepare, and they're always a hit! And check out Mrs. T's Facebook and Twitter pages too, let them know how YOU'RE eating your pierogies!